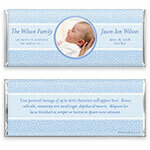 This clean and classic wrapper design is an ideal choice for announcing the arrival of your new bundle of joy. Design: Swirled background pattern with round photo frame. Personalization: Front band and photo with back message. Recommended Photo Size: 450 W x 450 H pixels.